El Mariachi (Carlos Gallardo) is a traveling guitar player with the modest desire to play music for a living. Looking for a job, he stops at a bar in a tiny town, where his simple, peaceful lifestyle is interrupted. Local hit men, expecting enemy assassin Azul (Reinol Martinez) to invade their town, believe that the visiting musician is the professional killer they are looking for. 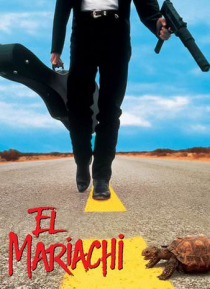 Unwittingly emb… roiled in vicious mob warfare, El Mariachi must shoot his way out of town if he is to survive.